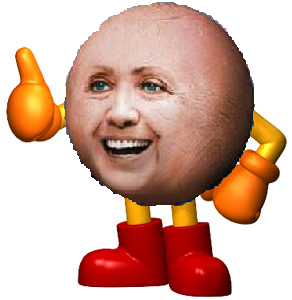 KoopaTV: What do Pac-Man and Hillary Clinton Have In Common? By LUDWIG VON KOOPA - A sense of inevitability. Recently on Miiverse, since Ridley has been slain, people are just obsessing over Pac-Man. Why would anyone want to do this? One of the first things we did when we made KoopaTV was establish how much we're against Pac-Man being in Super Smash Bros. 4, especially if he would be in just because Namco-Bandai is Sakurai's squad of code-monkeys. The fact is, people assume that Pac-Man will be in because he is Namco's mascot. Pac-Man is not the most qualified Namco character. Just like Hillary Clinton is not the most qualified Democrat Party nominee. She has done nothing in her life but ride along her husband's success. She has no accomplishments, just like Pac-Man has no accomplishments on any Nintendo system. Pac-Man's one major showing on a Nintendo console was Pac-Man Vs., a GameCube-exclusive designed by KoopaTV-enemy Shigeru Miyamoto. That was Nintendo's biggest announcement at E3 2003, and absolutely no one cared about the game. Because no one cares about Pac-Man. Same situation in 2014. Here is Pac-Man's Contest History over at the GameFAQs Character Contests. As you may remember (or guess), I use GameFAQs as a proxy for what tasteful console gamers prefer. Pac-Man does well against characters no one has ever heard of because he has high name ID. However, against characters that people know about, he drops in performance instantly. Especially against Nintendo characters. No Nintendo fan out there thinks very positively of Pac-Man. He's irrelevant and hasn't done anything on a Nintendo console. Just like how Hillary Clinton is irrelevant and hasn't done anything in public service. The comparison is even better when you consider how everyone considers Ms. Pac-Man to be the better game. No one in the world says Pac-Man is their favourite character or Pac-Man is their favourite game or series. Don't just take my word for it. Hillary can't even give an accomplishment, either. For another comparison of very popular things to talk about but no one actually likes them, see the Palestinians. They're an invented people, like Hillary's invented accomplishments and Pac-Man's invented importance. Every anti-Semite out there loves to talk about how Israel is an apartheid and treats the Palestinians like crap, but no one actually knows a Palestinian or likes them as a people. They're a bunch of terrorists. Other Muslims don't give a damn about Palestinians either, they just want an excuse to destroy the Jews. As I keep saying, Nintendo fans don't give a damn about Pac-Man. Console gamers in general don't care about Pac-Man. He has not done anything important in over 30 years. If you don't care for all the political comparisons I'm making, then here's all the proof I need that Pac-Man being in is a bad idea: Masahiro Sakurai's own words saying that Namco characters get no special treatment in deciding the roster. Pac-Man Museum even got canceled on Nintendo systems earlier this year, so it's pretty clear that Nintendo systems get some sort of special treatment from Namco. Just not positive treatment. In fact, a lot of Namco's ports of Pac-Man and other arcade games (I don't even know what new stuff the company makes) are NOT on Nintendo consoles. If Namco has to get a character, perhaps it should be one that actually did something on a Nintendo console and was IMPORTANT. Like Lloyd Irving from Tales of Symphonia. But that's just affirmative action. Still, Mr. Irving is a bit more popular for actually being relevant. No one would be seriously supporting Pac-Man or Lloyd Irving if Namco was not coding Super Smash Bros. 4. No one at all. Pac-Man doesn't even have interesting moveset potential. Sure, Sakurai could make a moveset for him. But if it was true to his games, it sure wouldn't be interesting. He already made that mistake with Sonic's moveset. He shouldn't do it again with Pac-Man. Sonic's set was boring. Pac-Man would be more boring. The most boring of all? What the Democrat Presidential Primary will be like if it's just Hillary Clinton's coronation. Get Joe Biden in there to get some action. I don't want to only watch the Republican Presidential Primary for 2016 to get some laughs. Bipartisan humour! It's not inevitable for Pac-Man to be in Smash 4. That's the talk of hopelessness. ...I think it might be hopeless for the Democrats to pick anyone besides Clinton, but do you really want Bush-Clinton-Bush-Obama-Clinton? America is more interesting than that. Ludwig has liked some Namco games before. Like Mario Superstar Baseball. You can follow Ludwig around by Following him at Miiverse at NNID PrinceOfKoopas. He lurks the Super Smash Bros. community a lot and talks down to people who support Pac-Man. He supports Rand Paul for 2016. Pac-Man failed to meet our low expectations for being a good addition. As expected, Hillary announced her candidacy. Lloyd Irving got in the game... as a Mii Fighter costume. Read the collection of the 2016 presidential primary reactions on KoopaTV here! Fortunately, Hillary does have competition. That's very good, because she would be HORRIBLE for videogames. Unfortunately, while Hillary did have competition, she and the Democratic National Committee rigged the primary process against her competition. What a weird website this is.